The Science Behind the Heavenly Smell of Old Books « Adafruit Industries – Makers, hackers, artists, designers and engineers! But what causes these smells? A UK chemist and teacher who runs the blog Compound Interest, an exploration of everyday chemical compounds, went to investigate and came up with an infographic to explain the matter. 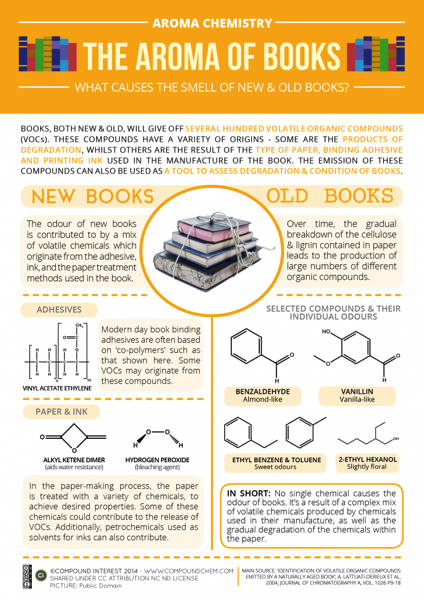 That “new book smell” is a combination of the volatile compounds released from ink, bookbinding adhesives, and the paper itself. There isn’t much existing research that looks into these aromas. Because of the variation in chemicals and the hundreds of compounds that go into the process, the exact smells are hard to pin down, the blog notes.